Come and stay with the Andi family in traditional wooden cabins on the banks of the Jatunyacu River. Fill your days with a choice of over 10 different activities as you explore the surrounding jungle and get an insight into the Kichwa way of life. 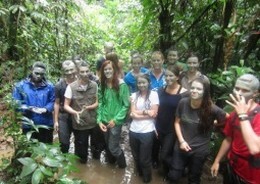 Our most popular jungle tour. You can choose what you do – giving you the right balance between experiencing traditional indigenous life, enjoying the natural wonder of the rainforest, being active and relaxing in hammocks. Note: There is a 2-person minimum for all jungle tours. Alcoholic drinks are not included. You choose your activities when you arrive. Come in sandals and light clothes suitable for walking in the jungle and bring enough clothes for 3 days (jeans are not recommended). Bring swimming clothes and a hat. A light or a torch for after dark and your camera (in a plastic bag or dry bag) to get some great photos of jungle life. Come and experience the jungle with us! Walk along jungle paths, over branches, through mud and streams – look out for the leaf-cutter ants and the birds! Toast it, grind it, mix it, stir it and… eat it! 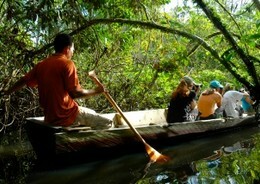 Explore the rivers, caves, villages and wildlife in the gentlest way – from the waterway. 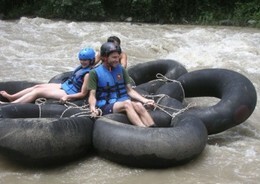 Float down the river and ride the rapids with tubing – it is rafting without the paddling! 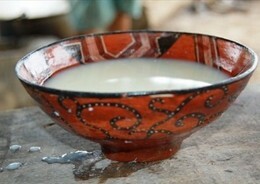 A traditional indigenous drink with varying strengths for children, women and men – try making it! For fun in a cool, clean natural pool, choose a trip to the lagoon. Feeling hungry? 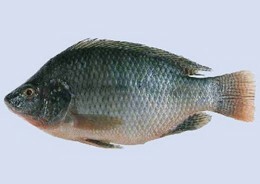 Try out traditional net fishing down at the river. Try out river panning and find yourself some treasure! Ecuador has over 4500 species of butterfly – see hundreds of them on this nocturnal walk. Get soaked on the climb up Pimpilala Falls – stunning scenery on this rocky hike. 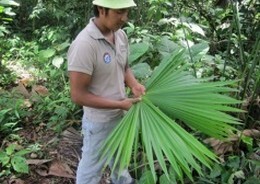 Learn about how the Kichwa people have been using the plants around them to survive for hundreds of years. Here is a suggestion of how to spend your time with us. But it is your trip and we want you to get the most out of it – so you can choose the activities you want! arrive at the family’s small farm at Cando. A short walk along a jungle path brings us to the wooden cabins that look out over the Jatunyacu River. Once you’ve put your bags in your cabin, we start our first activity. 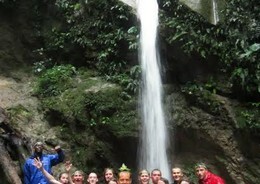 You might want to try something active, such as the waterfall hike or something more relaxing like learning about the medicinal plants growing around the cabins – cinnamon, mango, bananas, papaya and cacao are all in sight as well as plants (such as ayahuasca) that indigenous people have used for generations. After a traditional lunch, the second activity begins. 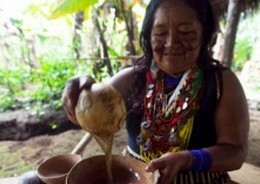 How about trying out some traditional indigenous skills such as fishing or heading down to the river to pan for gold. 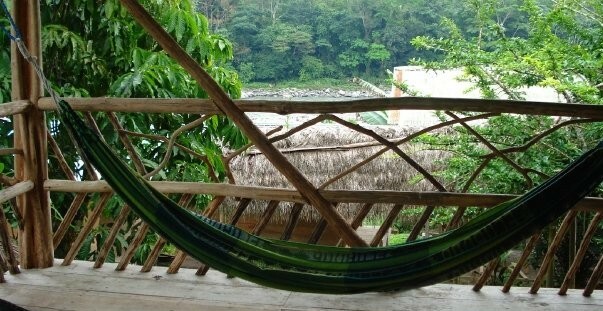 After that, there‘s always time for a gentle siesta in a hammock before dinner. You’ll wake up to the beautiful sound of the river rushing nearby, smell the fresh air around you and start your morning with a delicious breakfast. If you feel like something active, the walk to the Pimpilala Falls is exhilarating. Under the shade of the unforgettable rainforest canopy, we climb to the top of the three waterfalls and some of the highest parts of the park. We have time to enjoy its refreshing and energising natural waters before returning to the cabins for lunch. In the afternoon, you might want to try tubing down the river (great fun and not too much effort!) 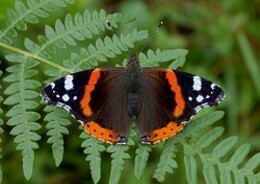 or wait for nightfall and watch butterflies on the nocturnal walk. On the last day, many people choose to walk to the lagoon – a beautiful, deep, natural rock pool where you can jump in, swim or simply relax on a sunny rock. 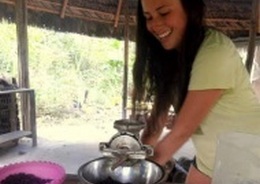 After lunch on the last day, one or the most popular activities is chocolate making. From picking the cacao pods straight from the tree, to roasting, grinding and cooking the chocolate, you’ll make one of the world’s favourite foods yourself! And best of all, at the end you’ll have a delicious dessert of sweet, sticky fresh-tasting chocolate – best enjoyed with some fresh mango or papaya, picked straight from the tree. After saying goodbye to the family and Victoria the Parrot, we head back up the path to where the 4×4 is waiting for us to take us back to Tena.